Cakes are presented on an iced board also trimmed with a matching ribbon. Cakes stacked or ready for display with separators or on a specialist stand ( to be supplied by customer). All additional decoration is charged as extra. ​2 tier wedding cake starts from £150 based on a 6" and 8" tiers - both tiers based on plain sponge. ​3 tier wedding cake starts from £250 based on a 6", 8" and 10" tiers - all tiers based on plain sponge. 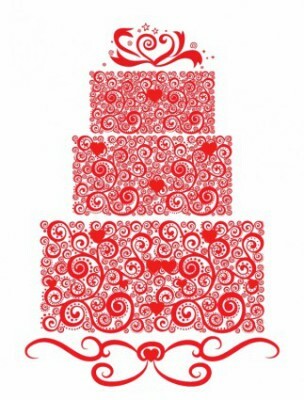 ​4 tier wedding cake starts from £350 based on a 6", 8", 10" and 12" tiers - all tiers based on plain sponge. Please allow 1 months notice to discuss and order your celebration cake. I may be able to supply a cake on a shorter time scale but this may not always be possible. Wedding cakes ideally require 6 months notice; however, if it is required earlier please contact me to discuss your requirements as I may be able to help with supplying your cake. 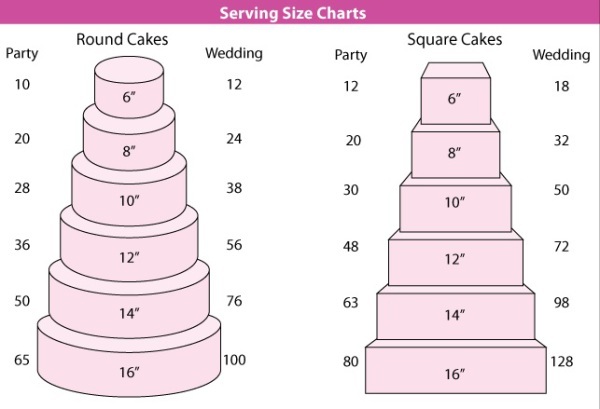 The chart below provides a guide as to the size of cake or cakes you will require for your event; this can be adapted to meet your cake design. Please note that in general a standard celebration cake is 3" tall and in general a wedding cake is 4" tall. The guide below shows starting prices for round basic sponge cakes. The price includes the cake filled and beautifully iced, some simple decoration and a message (if required). The cake will be trimmed with a ribbon and presented on an iced cake board. All additional decoration is charged as extra. Other shapes and sizes can be quoted for on request. A 50% non refundable deposit is required to confirm all orders. For orders under £100, the remaining balance is to be paid on delivery or collection. For orders over £100, the remaining balance is payable 2 weeks prior to delivery or collection of the cake. For any order placed with less than 2 weeks notice, the full amount is due on order confirmation. Payment can be made by cash or bank transfer. If paying by bank transfer, the payment must have cleared before the cake is delivered or collected. I deliver cakes throughout Hertfordshire and the surrounding counties. Delivery is free for the first 5 miles and charged at £1.50 per mile thereafter. I am able to set the cake up at the venue and the set up cost is determined by the time needed to assemble the cake. Please request a quotation when ordering if you would like to use this service. Alternatively you are welcome to collect your cake. If the cake is collected, That Cake Company will provide transport, assembly and storage instructions where necessary. Please note that once collected, full responsibility for the safety of the cake lies with the client, That Cake company is not liable for any damage to the cake once it has left the premises.